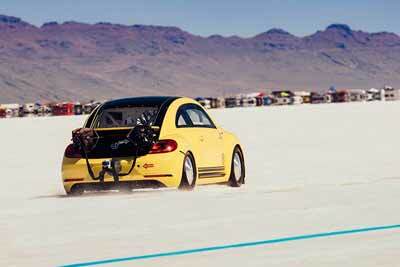 A specially-tuned Volkswagen Beetle has set a new speed record at the World of Speed at Lake Bonneville in Utah. 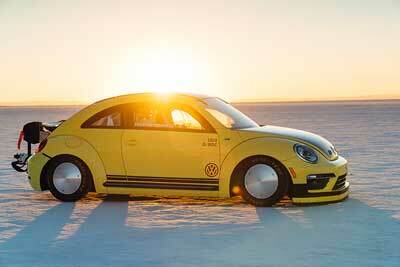 The Beetle LSR (Land Speed Record) achieved the fastest ever speed documented for a VW Beetle. The record-breaking run took place at the driving record event sponsored by the Utah Salt Flats Racing Association (USFRA). A speed event held in the mid-summer every year. As you might expect, in order for the Beetle to reach speeds of over 200mph, quite a few modifications were made to the Beetle LSR. Changing the turbocharger, pistons, camshafts, connecting rods and modifying the cylinder head, boosted the power of the 2.0-litre TSI engine to a heady 542bhp. Torque also increased to 421 Ib ft, useful for powering along the salt flats. The car was modified to conform with the regulations and to drive at speed on the salt flats. Special wheels and tyres were fitted for driving on salt. Then VW engineers lowered the body and fitted a limited-slip differential to improve traction. Preparing for the worst, a rollover protection cage, race seat, five-point harness and a fire extinguisher were fitted for safety. Finally, two brake parachutes were fitted to slow down the Beetle (and let’s be honest, any self-respecting LSR car needs parachutes). The result, the Beetle reached 205.122 mph (328.195 km/h) over a distance of one mile. A new record and the fastest ever speed documented for a VW Beetle.